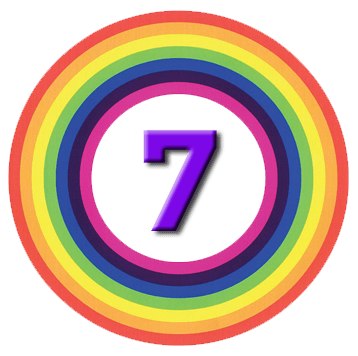 Today’s post is our sixth visit to a popular investing book – Mark Minervini’s “Trade Like A Stock Market Wizard”. We’re going to be talking about Risk Management. The final two chapters of Mark’s book are concerned with risk management. Risk management is the most important building block for achieving consistent success in the stock market. Anyone can have short-term success by being in the right place at the right time,but consistency is what differentiates the pros from the amateurs. Success is not decided by your winnings from any particular day, month, or quarter; it’s what you keep year in and year out. I’ve witnessed many people make millions of dollars during good times, only to give it all back and even go broke. A big mistake I see many traders make is to consider trading profits as house money, acting as if that money somehow were less their own to lose than their original starting capital. Yesterday’s profit is part of today’s principal. At the end of each trading session, ask yourself: Am I bullish on this position today? If not, why am I holding it? Does your original reason for going long remain valid? The key building blocks for success include executing the basics better than the other guy and doing it over and over again. When you lose money, you will need a greater percentage gain to get back to even because losses work geometrically. The larger the loss, the more difficult it is to recover from. 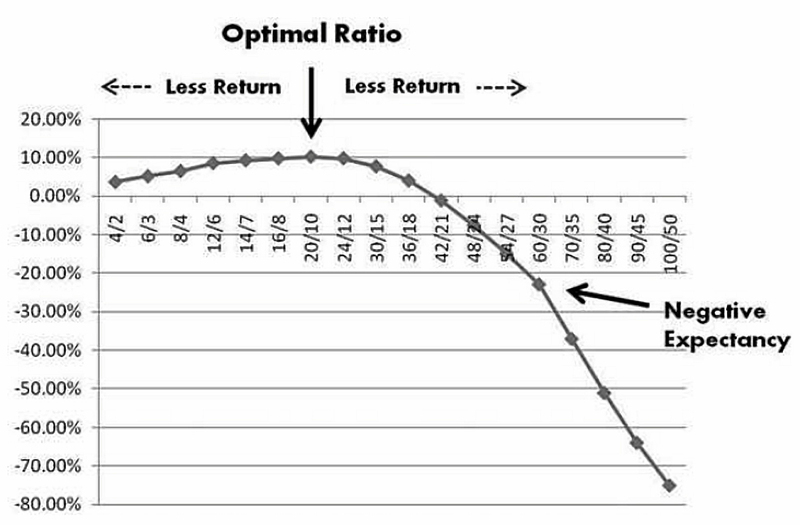 Mark has 10% as an absolute maximum loss, but usually uses 6% to 7%. You have to become consistent. 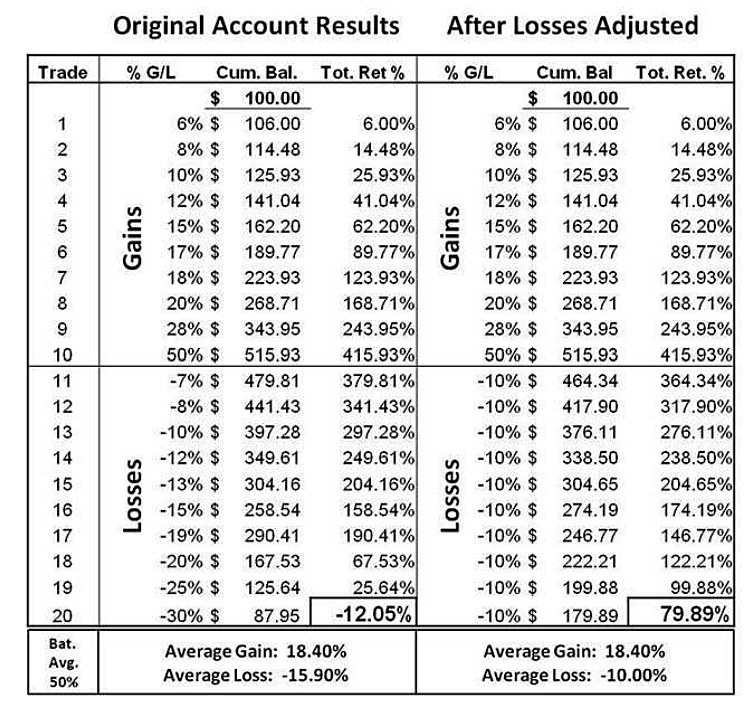 Early in his career, Mark carried out an exercise of standardising his losses at 10% (per trade) to see what the effect would be on his returns. This is the same as using an automatic stop-loss. Based on 10 winners and 10 losers, instead of a double-digit loss in his portfolio, he would have had a gain or more than 70%. Some investors feel they don’t need a stop-loss because they buy only quality stocks. There’s no such thing as a safe stock. Coke topped in 1973, declined 70 percent from its high, and then took 11 years to get back to even. Kodak took 14 years to break even, just in time for the crash of 1987. How low can it go? To zero! I’ve been asked, “How do you know when you’re wrong?” My answer is always, “The stock goes down.” In fact, I will often sell a stock if it doesn’t go up shortly after I buy it. There is only one way to protect your portfolio from a large loss,and that is to sell when you have a small loss before it snowballs into a huge one. Mark discusses the disposition effect, where people hang on to things (in this case stocks) because they overvalue the things the already own. We’ve discussed this previously when we looked at behavioural investing. Investors are more likely to allow a stock to reach a large loss than they are to allow a stock to attain a large gain; they hold losers too long and sell winners too quickly. The probability of buying additional shares is greater for shares that have lost value than it is for shares that have gained value; investors may readily double down on their bets when stocks decline. 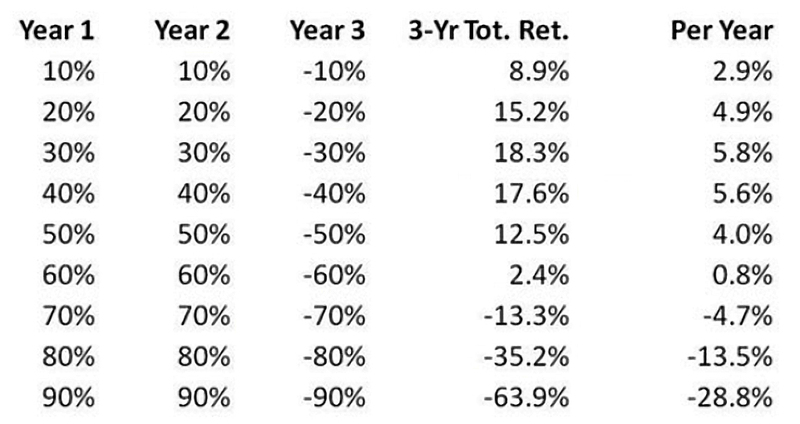 Investors are more likely to take a small gain than a small loss. There is one thing I can guarantee: if you can’t learn to accept small losses, sooner or later you will take big losses. Every major correction begins as a minor reaction. You can’t tell when a 10 percent decline is the beginning of a 50 percent decline until after the fact. Every dollar saved is a dollar earned, and more money that can be compounded when you latch on to your next big winner. The Achilles’ heel of most gamblers and speculators is the desire to play every hand. $1,000 guaranteed or $1 million with a 1 percent chance of losing everything? As a stock trader, you probably will make thousands of stock transactions over your lifetime. If it’s a one-time event, take the shot at the million. But with 100 or more transactions, the 1% probability will leave you broke; hence, take the sure thing. You cannot be correct all the time. If you make more on your winners than you lose on your losers, that’s all you need. Being wrong is unavoidable, but staying wrong is a choice. To have lasting success in the stock market, you must decide that it’s more important to make money than to be right. In trading and in life, how you deal with losing is the difference between mediocrity and greatness. Good trading is boring; bad trading is exciting. You can be a bored rich trader or a thrill-seeking gambler. Expect the best and plan for the worst. The best way to ensure stock market success is to have contingency plans and continuously update them. You need to develop a dependable way to handle virtually every situation that is thrown at you. Having things thought out in advance is paramount. a disaster plan (for black swans, including things like power failures and internet problems). Amateurs are scared of positions that stop them out once or twice or just weary of the struggle; professionals are objective and dispassionate. Contingency planning plays is that it enables you to make good decisions when you’re under fire, when you need it the most. To make money consistently, you need a positive mathematical expectation for return – an edge. Your net reward / risk ratio must be greater than one. Mark says he is right about stocks only about 50% of the time. He wins by making the winners bigger than the losers. Mark believes you should cut your losses at half the size of your average (historical) gain. This is the 2R rule, where R is the amount of money you put at risk on a single trade. 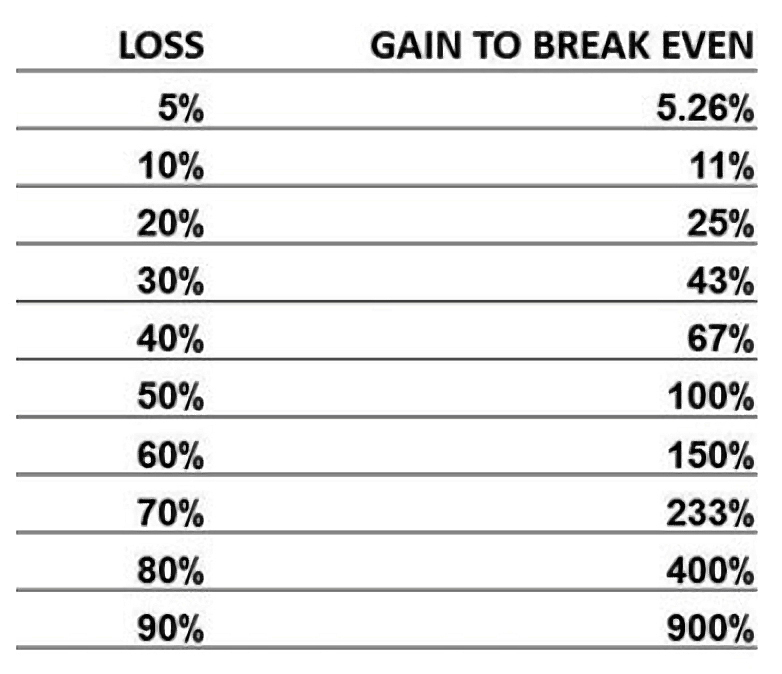 You risk R to gain 2R, which means that only half of your trades have to be winners for you to break-even. But even if you average more than 20% on winners, your maximum stop-loss should be 10%. Not defining and committing to a predetermined level of risk cost traders and investors more money than any other mistake. 1. Your stock selection criteria are flawed. 2. The general market environment is hostile. If you’re experiencing a heavy number of losses in a strong market, scale down your exposure. When your trading plan is working well, do the opposite and pyramid back up. Mark is very much against averaging down. Throwing good money after bad is one of the quickest ways to the poorhouse. We have more on this here. When the price rises by three times my risk, I almost always move my stop up to at least breakeven. You may have heard that you should widen your stops on the basis of the volatility of the underlying stock. I strongly disagree. High volatility usually happens during a tough market environment. Your gains will be smaller and your batting average lower. 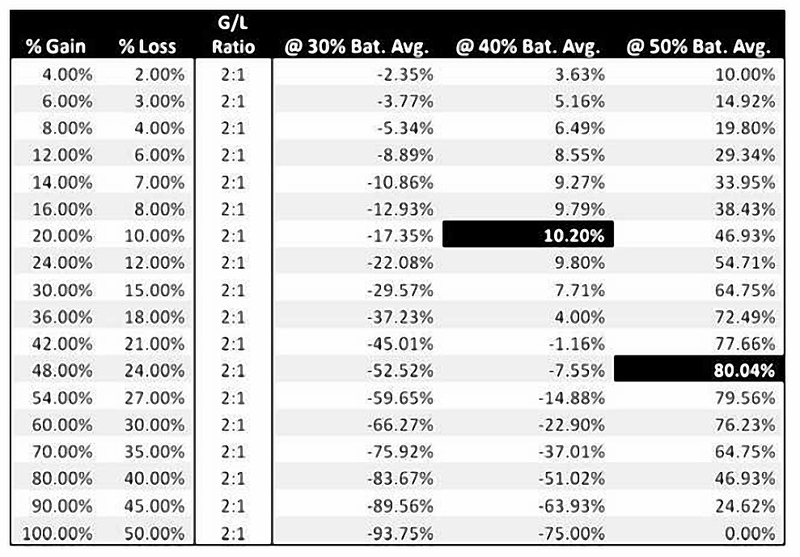 Once your batting average drops below 50%, increasing risk will lead to negative expectancy. The table above shows returns for a 40% batting average. Tighten up stop losses (say from 7% to 5%). Get off margin (leverage) immediately. Reduce position sizes and overall capital commitment. Depending on the size of your portfolio and your risk tolerance, you should typically have between 4 and 6 stocks, and for large portfolios maybe as many as 10 or 12 stocks. This will provide sufficient diversification but not too much. You should not hold more than 20 positions. In my career, I have had many periods in which I put my entire account in just four names. This of course corresponds with some of my most profitable periods. Mark closes the book by stressing how easy it is for the private investor to trade, compared to the 1980s when he started. It’s a much more level playing field today between the amateurs and the professionals. Even casual investors have tools at their disposal—from online trade execution to free charts—that I couldn’t imagine in the old days. Don’t say the deck is stacked against you, retail players can’t win, or only the professionals make money in the market. These are simply excuses. Smart people learn from their mistakes but really smart people learn from other people’s mistakes. I have made my share of mistakes and have learned the hard lessons. In this book I have presented to you a sound plan based on my experience. It’s now up to you to stick to it. We’ve reached the end of Mark book, in a couple more articles than I usually aim for. It’s quite a long book, and Mark has a discursive and somewhat repetitive writing style. That said, I’ve found the last few chapters in particular to be illuminating and relatively easy to implement for the private investor. I’ll be back in a few weeks with a summary of the six articles that I’ve written to date. After that, I plan to try my hand at building a Minervini stock screen. Experience is that marvellous thing that enables you to recognise a mistake when you make it again.